Euronext’s Best of Book is a Best Execution service for retail orders. Dedicated liquidity providers offer price improvement for the retail flow, and the service operates within Euronext’s robust and highly regulated Central Order Book. Best of Book covers over 550 stocks. Reconsider the need to connect to other platforms to get Best Execution, you can send orders through your existing access. No IT development is required to become a Retail Member, access is through your existing connection with no additional latency or cost. Unlike our competitors, Euronext offers you a true price to trade, as you are trading in full competition within the Central Order Book where the liquidity is the deepest in Europe. A pool of liquidity providers compete for your business, potentially improving the pricing available, and you have no need to pre-select a preferred liquidity provider. Euronext has been operating exchanges in Europe for over 400 years – and we never cease to improve.Prices are actual firm prices. Best of Book meets national regulatory requirements and traders receive a regulated market stamp. It is fully compliant with MiFID II (2018). See competitive prices compared to the EBBO1 in an additional layer of the regulated market’s Central Order Book. To guarantee pre and post trade transparency, you get daily and monthly Best Execution reports, so investors are able to measure the quality of order execution and price improvements against clear, objective and measurable benchmarks. 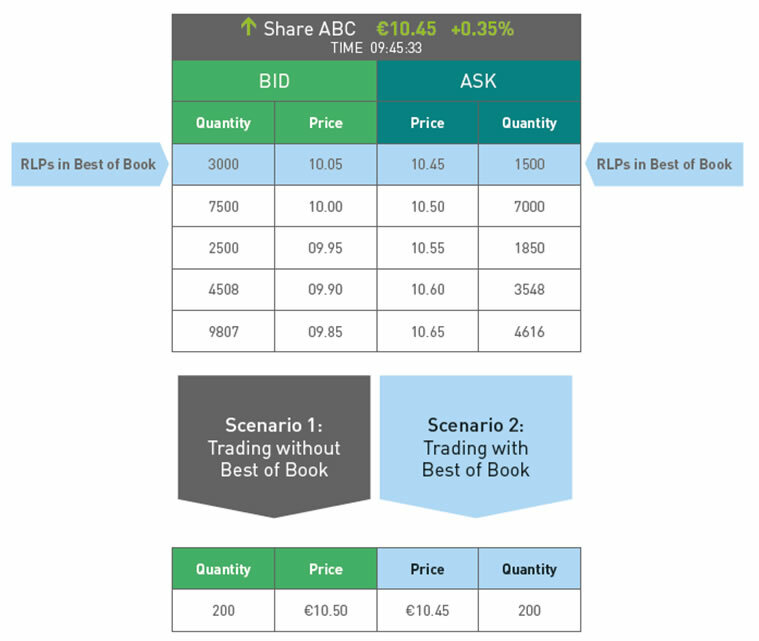 Euronext’s Best of Book service helps retail brokers meet MiFID best execution requirements within a single platform for all liquid stocks traded across Euronext, potentially saving you the need to connect to multiple platforms. A specially designed Retail Liquidity Provider (RLP) programme provides price improvement to retail investors. The RLP programme is highly competitive and is open to all eligible Euronext members, thus ensuring absolute neutrality. RLP quotes are firm orders and execute in direct competition with the Euronext Central Order Book. These quotes are at, or better, than the European Best Bid and Offer (EBBO). You will also receive daily best execution reports, provided via an independent data provider to ensure full compliance with your best execution policy. Euronext’s prices are at the EBBO 87% of the time, which is 20% better than the second best performing platform². With Best of Book, this rate goes up to 99.63%³. Best prices are first set on Euronext 69% of the time, almost eight times more than on the second best performing platform². Relative spreads are 44% tighter on Euronext – at 4.32 bps – than on the second best performing platform². Market depth is 1.5 times higher on Euronext – at €53k – than on the second best performing platform ². Best of Book helped retail investors to save €7,799,202 in H1 2018. It delivered 99.63%3 of best execution success 27.40%3 of the value traded being better than the EBBO. 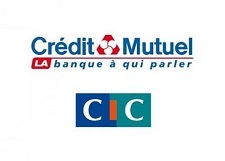 More than 550 stocks are covered, including the most liquid securities from Euronext’s national domestic indices: AEX®, AMX®, BEL 20®, CAC 40®, Next20®, CAC Mid 60®, PSI 20®. The service is available through the following Euronext market places: Amsterdam, Brussels, Lisbon and Paris. 1 In the best execution analysis provided by a third-party, the EBBO (European Best Bid and Offer) refers to a benchmark price reflecting the best possible price available among all European lit venues on which the instrument could have been traded at the time of trade. 2 For securities that belong to the AEX-index, AMX-index, BEL 20, CAC40, PSI 20, and SBF120 indices - in H1 2018 (Source: TAG Audit) www.euronext.com/market-quality. 3 In H1 2018 (Source: LiquidMetrix). The price improvement details can also be circulated along the intermediary chain to the retail investor, as daily reports can contain ‘Order ID’ or ‘Client Order ID’ information.